Using your iPhone or smartphone whilst driving your car isn’t exactly the best idea, and is illegal in a lot of places, the latest iPhone accessory doesn’t exactly seem like the best idea, and we don’t think it would be the safest thing to use whilst you are driving, the Steer Safe. 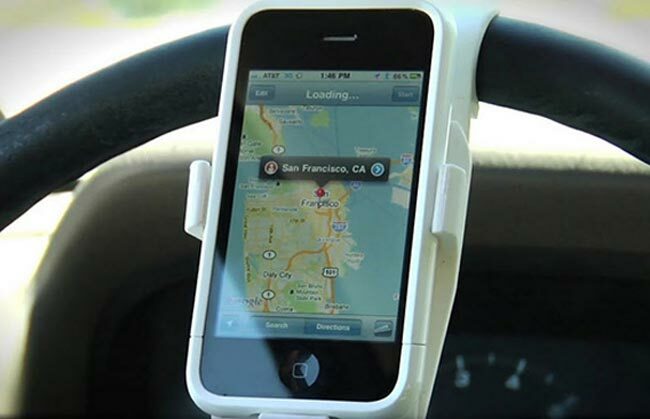 The Steer Safe is an attachment for your steering wheel that is designed to house your iPhone 4, and let you use it on your steering wheel, and the designers of the device say that it should only be used when you vehicle is parked or stationary, although in the video they seem to be using it whilst driving. Should you want one of these devices, the Steer Safe is a Kickstarter project, and it will cost around $30 if it actually goes into production.